Background: Endometriosis is a debilitating and chronic inflammatory gynecological disease of reproductive age women. Two major clinical symptoms of endometriosis are chronic pelvic pain and infertility, which profoundly affect the quality of life in women. Current treatment strategies include surgical intervention, anti-estrogen hormonal therapy, or a combination of both. The existing treatment modalities fail to prevent recurrence of disease and affect reproductive health of women. This suggests a fundamental need to identify potential cell signaling pathways for nonestrogen or nonsteroidal targets for endometriosis. A growing body of evidence indicates that growth factors, cytokines, and prostaglandins promote the establishment and maintenance of endometriosis. 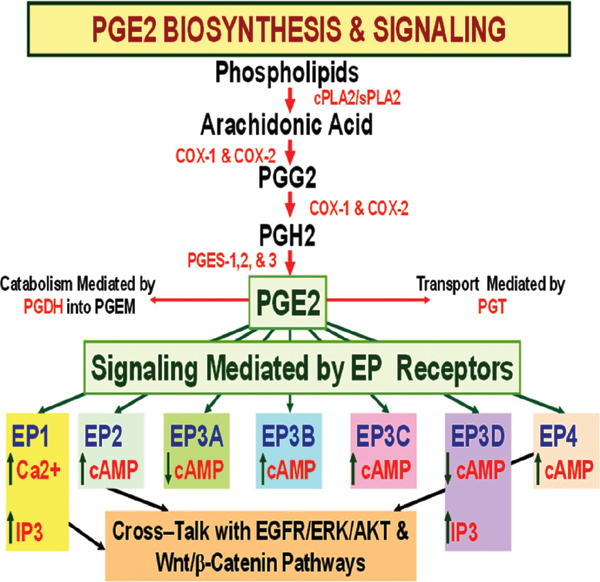 Objective: Published literatures related with prostaglandin E2 (PGE2) signaling and pathophysiology and pathogenesis of endometriosis are comprehensively reviewed. This review specifically focused on the interaction between PGE2 receptors EP2 and EP4 signaling and adhesion, invasion, growth, survival, and epigenetics, fertility, and pain in endometriosis. Results: EP2 and EP4 receptor proteins are highly expressed in endometriotic lesions compared to endometrium from women with or without endometriosis. Inhibition of EP2 and EP4 signaling decreases adhesion, invasion, growth and survival of human endometriotic cells in vitro through multiple cell signaling pathways. Inhibition of EP2 and EP4 signaling modulates DNA methylation and H3 histone methylation machinery in human endometriotic cells in vitro. Inhibition of EP2 and EP4 signaling decreases innervation of the endometriotic lesions and decreases pelvic pain and decreases progesterone resistance and restores endometrial receptivity mechanisms in vivo in preclinical xenograft mice model of endometriosis. Conclusion: The advantages of selective inhibition of EP2 and EP4 are to: (i) inhibit of adhesion, invasion, growth and survival of endometriotic cells; (ii) decrease PGE2-inudced inflammation and pain; (iii) decrease estrogen-dominant and progesterone resistant states in endometriotic lesions and endometrium, and (iv) improve endometrial microenvironment to support implantation and pregnancy. These findings suggest that inhibition of EP2 and EP4 receptors could emerge as a potential nonsteroidal therapy for the treatment of endometriosis. PGE2, EP2, EP4, endometriosis, epigenetic, fertility.